Happy Valentine's Day weekend! Whether you enjoy the whirlwind of chocolate and champagne or find the holiday too commercialized, I hope you had/are having a great weekend (it's a three-day weekend in the states). 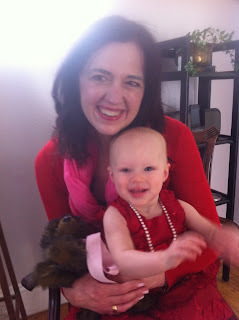 My daughter and I enjoyed wearing red and having the excuse for presents :-). I've running a favorite literary romantic moments contest on my website and one comment reminded me of a particular category of romantic moments that can be especially poignant and powerful. Farewells. Whether it's the end of a love affair or a moment of separation on the road to a happy ending, farewells can bring out confessions of emotions that are suppressed in less tumultuous times. In Imperial Scandal, I loved writing the farewells between the various couples at the Duchess of Richmond's ball before the battle of Waterloo. It was a bit of challenge to write so many different goodbye scenes, but I also found it was a great way to differentiate how each couple's relationship was unique. Here are some of my favorite farewells from books and movies. Damerel telling Venetia she could should go off to London and that their romance was nothing but a light flirtation in Georgette Heyer's Venetia. Heartbreaking, because you know he's doing it to be noble and finds it as hard to part from her as she does to part from him. James writing what may be his last letter to Susan in Steven Brust & Emma Bull's wonderful epistolary novel Freedom & Necessity. James is driven by causes bigger than himself, so it's a powerful moment when in the midst of crisis he tells Susan just how much she means to him. Sarah and Guy saying farewell at the train station in Jewel in the Crown/The Raj Quartet (both in the book and the television series). A Pride and Prejudice scene that occurs only in the Garson/Olivier movie. Darcy comes to see Elizabeth after the news of Lydia's elopement. He leaves to go look for Wickham and Lydia. He turns back at the door and says this is perhaps the last time they will ever meet and adds "God bless you, Elizabeth" (echoing the closing of Darcy's letter in the book). Elizabeth looks round, wanting to stop him, too late. Leslie and I have talked on the blog about what a wonderful heart-tug this moment is. Rick putting Ilsa on the plane in Casablanca. Need I say more? What are some of your favorite romantic farewells in books or movies? Writers, are these scenes you enjoying writing? When Margot is telling Percy goodbye as he is about to go save Armand in "The Scarlet Pimpernel". I agree, Jan Marie! I almost mentioned that, except that the scene that really sticks in my head is the one from the Andrews/Seymour movie (and "EL Dorado") where she comes to see him in prison,and it really isn't a farewell. You've named some of my favorites! Another of mine is the scene in Flowers from the Storm in which Maddie has to read her repudiation of her marriage to Jervaux and he shows up at the Quaker meeting house. He struggles through his confession / declaration of love in such a heart-wrenching way and then storms out saying he will only wait an hour for her to follow. He waits across the street for hours thinking she has broken with him for good. He waits because he just wants to see her one more time. It is a beautiful scene, made all the better when she comes out, looks for him as if she knows he will be there and tells him the only thing she is good for now is to be his duchess. LOVE that scene! Another favorite that is simply frivolous is the scene in Star Wars II in which Han Solo is about to be frozen and Princess Leia says "I love you." and he says "I know." Love that that scene! I should have mentioned that scene from The Empire Strikes Back, Louisa! It got me at the age of 12 and still does! The end of Vienna Waltz is a blatant homage to the Han/Leia scene. Love it, Tracy! Blatant homage is the sincerest form of flattery! George Lucas should be proud! I hope so! Malcolm & Suzanne just wrote their dialogue that way. And it really seemed right for them.